Netpower Review 2019: Is Netpower a Good Hosting? Netpower provides a comprehensive suite of website hosting packages, with plans ranging from single WordPress websites all the way up to huge reseller accounts. They’re a fast and reliable option for website hosting, although their prices aren’t the most affordable. 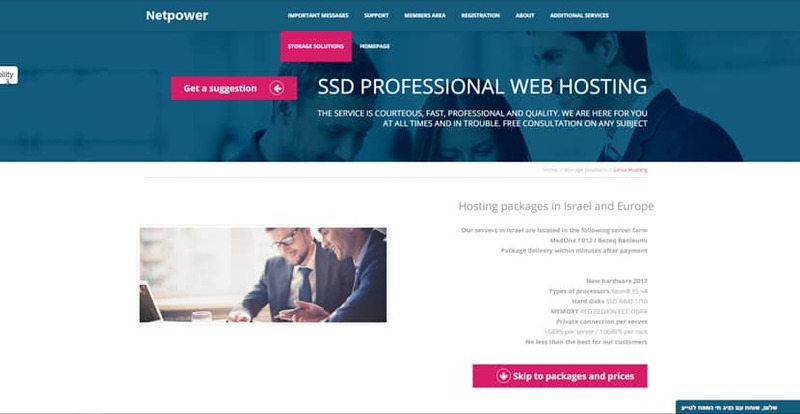 Israel-based web hosting provider Netpower has been offering website hosting solutions since 2011. They now serve customers outside Israel, including France, Germany, Amsterdam, Singapore, Australia, Canada, and the United States. They offer a wide variety of hosting services, including shared hosting solutions for personal and basic small business websites as well as larger servers for resellers. Netpower offers WordPress-optimized shared hosting and virtual servers, website hosting for both Windows and Linux, dedicated server rental, and reseller packages. They have servers located in Europe and Israel. Their WordPress shared hosting plans feature only hardware released from 2017 onwards, Xeon® E5 v4 processors, SSD RAID 1/10 arrays, and REG ECC DDR4 memory. Even their most basic plan allows you to have unlimited subdomains, a nice bonus that you don’t often see with other web hosting providers. One thing I really liked about Netpower was that they stated a cap of 100GB monthly traffic in their basic WordPress package. Unlike other companies that offer unlimited traffic but actually have limits hidden in the fine print, having that 100GB cap stated upfront was clear for me to understand and should prove more than adequate for most small to mid-sized business websites. Sadly, the same does not apply for their regular shared hosting packages, which cite unlimited traffic and unlimited storage space. Further, while they still provide regular backups, it appears that unlike their WordPress hosting plans, you won’t get any free SSL certificates with these Linux shared hosting plans. Note also that while they state a 99% server availability with their Linux shared hosting plans, there doesn’t seem to be an uptime guarantee with their WordPress hosting plans. Netpower has a full suite of plans ranging from their basic entry-level Linux shared hosting to high-powered dedicated servers. All of these are characterized by more than enough space and bandwidth. What I love is their flexible pricing: they offer month-to-month pricing with no long term commitments required. Also, unlike some other companies, the prices listed are their actual prices; they aren’t low rates valid only for the first few months to entice you into a long-term contract. This makes them an excellent choice for a new website owner who wants a no-obligation provider. However, the downsides of this flexible pricing scheme is that they don’t offer offer any discounted rates for longer contracts, nor do they offer a free trial. Also, their monthly rates, while comparable to those of some of their established competitors such as Bluehost or GoDaddy, are fairly pricey for the market. I found Netpower’s quality of support to be above average. Since they’re an Israeli company with a workweek that differs from the rest of the world’s, they provide telephone support Sunday – Thursday between 10 AM and 9 PM, in addition to live chat support 24/7. They usually respond to their live chat within a few minutes. Each time I’ve spoken with their representatives, they’ve always been friendly and helpful with an ability to get the job done. While their website is in Hebrew, they do provide English-speaking support upon request. There were two downsides I found with Netpower. First, their website is not set up for beginners. Unless you have a clear idea of what website hosting is and what you require, the information may feel quite overwhelming and complicated. Second, their website is in Hebrew, making it hard for non-Hebrew speakers to navigate and understand, even with Google translate. It would’ve made it much more accessible if the website was available in English. Netpower is a full-service website host for people who are serious about hosting their websites. Whilst they do offer services for larger companies and resellers, where they really excel is by having a range of packages for beginners which include top class features, such as, unlimited subdomains, unlimited databases and unlimited languages serviced in the cpanel. Wondering how Netpower stacks up against other Web Hosting companies? Enter any other Web Hosting company and we will give you a side-by-side comparison.